The secret to a gorgeous Christmas tree is really not such a secret. Decorating the perfect Christmas tree comes down to one thing: careful planning. A Christmas tree is really just a smaller version of any beautiful home décor. A well-designed home interior contains variations in color, texture, size and material. The same holds true for a well-decorated Christmas tree. Before selecting ornaments for the tree, decide on the theme for your home’s holiday décor. Often, the theme of the tree will reflect the style of the home. A tree in a cabin or log home could reflect the rugged outdoors. A contemporary space invites a modern, minimal look on the tree. A Victorian-style tree would fit in beautifully in an historic home. Having a theme in mind will make shopping for the ornaments much easier. The color scheme of the tree is also important. It is not necessary to decorate with traditional red and green; in fact, in many homes a non-traditional color scheme will be more complementary to the home’s décor. A tree decorated in a scheme of peacock blue and silver or fuchsia and bronze is a lovely change from the tried-and-true palettes of the past. Using the holiday color tones selected to coordinate with the home’s interior décor, choose several types of ornaments in complementary hues. 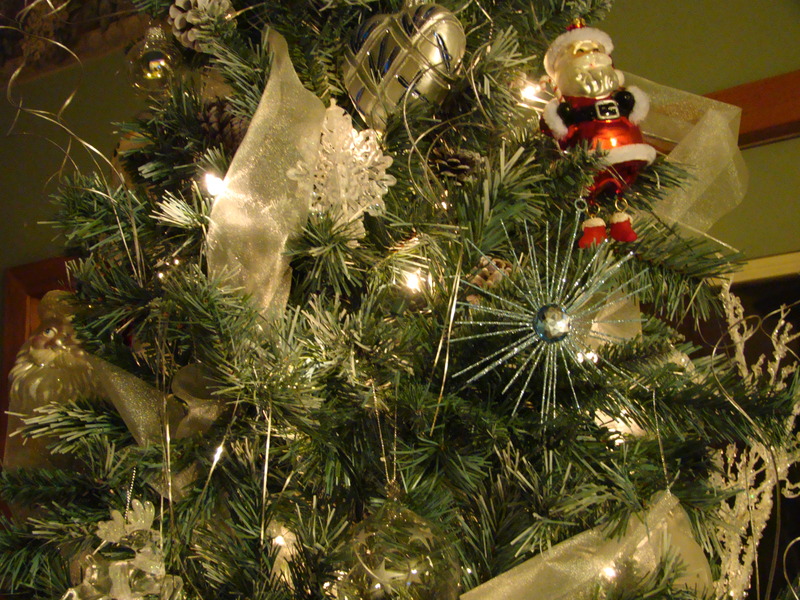 Select ornaments that are shiny, matte and rough in texture, making sure to stay with the desired theme of the tree. For best results, choose pieces in no more than three colors. This limited color palette will ensure a sophisticated, professional-looking Christmas tree. Purchase ornaments in quantities of at least six. Repeating the ornaments around the tree adds to the rhythm of the tree, making it look like those trees found in the pages of decorating magazines. Ornaments need not be expensive to be beautiful. Often, ornaments purchased at discount stores are very affordable and perfectly lovely on the tree. Large ornaments have been popular for the last several holiday seasons, and continue to be readily available. The scale of these pieces adds a beautiful contrast to the smaller glass ball ornaments traditionally seen on trees; using several sizes and textures together will give create the most interesting look. Consider using some unconventional décor on the Christmas tree this year. Adding some eucalyptus branches, peacock feathers, wide ribbon, coiled wire or strings of beads among the ornaments brings a touch of the unexpected to holiday decor. Raffia makes a nice alternative to tinsel on a rustic, country-style tree. Large silk flowers can also make a big impact for very little cost, making this year’s tree one-of-a-kind. Lighting is an integral part of any Christmas tree, no matter the decorating style. The latest holiday light strings use LED bulbs. While these lights are more expensive to purchase than traditional Christmas lights, they last longer and use much less electricity to operate. Simple white lights offer the most flexibility for future holiday decorating. However, adding colored lights to the tree will help to reinforce the color scheme and overall decorating theme. Consider lights in deep blue or rich gold for a different holiday twist. Although it may seem that the beautifully decorated Christmas trees found in magazines take a professional touch and a large budget to create, anyone can bring an expert touch of holiday cheer to their home with a little imagination and careful planning.